Call it generational bias. Blame it on the way history is taught in school (with one exception, in my case). The world before 1960 seems black and white. I hear it in the stories older generations tell. It’s not, of course. The world isn’t just filled with gray, it’s filled with all the colors of the spectrum. I’ve been fooling around with a birthday gift the last few days: a film scanner I’ve been lusting over to scan my grandfather’s slides (as in photography). 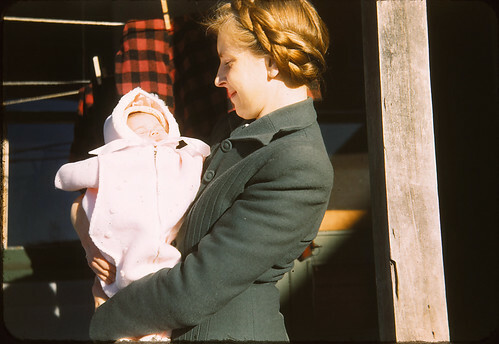 I never thought color film was available on the consumer market until much later, but hidden in the stuff scavenged from my grandmother’s things was a box of one hundred color slides… taken between 1942 and 1944. 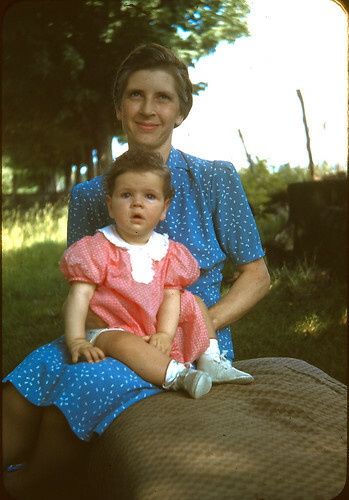 Seeing baby pictures of my mother, my grandmother, my great-grandparents, and half a dozen aunts and uncles (with a few greats to go around) in color has been a thrill. I know, I’m easily duped, but pictures are a powerful medium. Seeing so many old pictures in black, white, sepia, and the silvery highlights of the really old ones contributed to my bias… my feelings that modern society tended to be morally superior. Considering where we are, isn’t that sad? These pictures reminded me we’ve been seeing more than black and white for a long time. The capacity for critical thought goes back beyond the 1960s. Even our ancestors had rods and cones. *If you’re out there Christy, I don’t want to hear about photosensitive ganglion cells. I love looking at old photos. I wish my ancestors took more, thought I understand it’s not like today. Film was (is) expensive, whereas digital is virtually free. I take lots. I wonder if on some level I’m compensating. My father’s family is Russian and when I saw the movie Eastern Promises, I felt like I was watching them all in color. It was very jarring. Then I remembered a box of color slides. I dug through, and sure enough, I found some slides from my parents when they were dating–and I had an uncle who looked just like Viggo Mortenson, down to the hair and everything. It was weird . . . sort of made their life come alive as more than nostalgia.